Introductory 0% interest for up to 45 days on purchases. Customer can choose international card types between VISA and Union Pay. Experience South-Korea like never before. Special offers up to 50%. Click here. Cardholder can have up to 20% discounts available at Korean top 13 hospitals. Must be over 18 years old and Mongolian citizen or temporary resident in Mongolia. Introductory 0% interest on up to 50 days for purchases. If any of them happened, you can get free advice from “MAPFRE ASISTENCIA”, worldwide professional service provider company, and solve the problem with experienced professional advisors. №99 Jian Guo Road Beijing – 100020 P-R.C. Visa International and MasterCard Worldwide collaborate with Priority Pass Ltd., which manages more than 600 VIP lounge rooms in 300 cities of 100 countries in the world. The Platinum cardholder of our bank also can enjoy all privileges of the company, regardless of airline or class type. This privilege enables you to avoid noise and hassle, lets you enjoy your time in comfort. You are given the opportunity of making calls, receiving internet and fax services. You will earn Concierge service as a Premium cardholder. In other words, this service provides information about luxury services all around the world, also recommend and book for those. You have access to the service that you want from anywhere and anytime. If you wish to know more about or request above services, please visit www.visaplatinium.com. Or you can call to toll free numbers from below link. Emergency cash disbursement: Cash will be delivered to you through worldwide network of cash disbursement agencies. Please click here to get toll free phone number of Visa Card. For example: If you are traveling in Germany and wish to connect to English call service, you can 08001822809. When you report lost/stolen card to Visa Platinum Card Service, your card will be closed immediately on Visa Network and transfer that information to TDB in 30 minutes. Therefore, you can transfer your information anywhere around the world. You can talk with 9 different languages through international 550 toll-free numbers, also if you don’t talk those languages, you can have translator to get the information. You can connect to VPCC about Concierge Service. For platinum card service information, please visit www.platinum.com. Must be over 24 years old and Mongolians citizen or temporary resident foreigner in Mongolia. No prior bad credit history with banks or financial services companies. Introductory 0% interest on up to 45 days for purchases. Specialized premium services and discounts for ladies. As being a Lady Premium Card cardholder, you can have access to discounts and special services from trending stores and beauty shops. Currently, we have discounts from around 100 companies. If you wish know more about discounts, please CLICK HERE. Must be over 18 years old and Mongolians citizen or temporary resident foreigner in Mongolia. By collateralizing your term deposit account, you can use the card for your money necessity, also can have benefits, such as saving time, make transactions fast, and not cancelling time deposit etc. It is available to get Saving Collateralized Credit Card from all TDB branches. A term deposit accountholder at TDB. 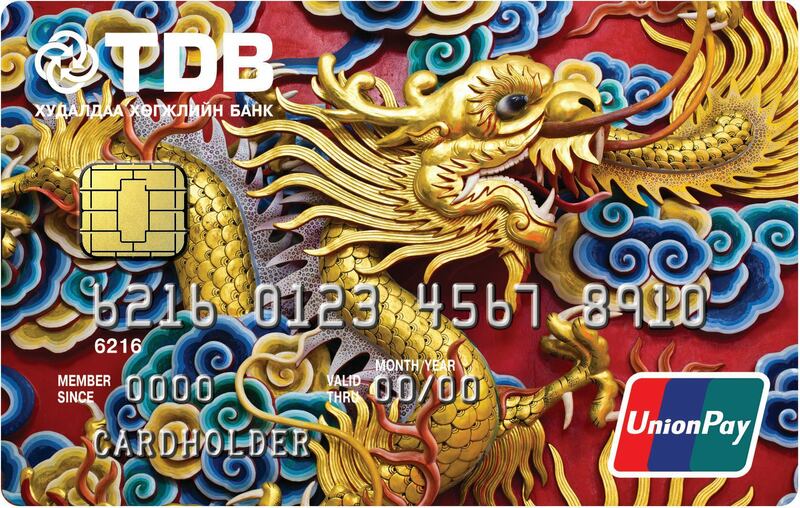 * For Union Pay card, it is available to withdraw cash from “Inner Mongolian Bank”. You can get up 10% discounts from DUTY FREE stores all around the world by using Union Pay card. Please see DUTY FREE store locations from HERE. Get 1% discount by purchasing oil from M-oil stations. Get 1% discount by purchasing oil from MT, M-oil stations. Completed “Customer request” /new customer at TDB/. Once you’ve received the TDB Gift card, you must activate it. To activate your TDB Gift card, visit https://www.cardcentre.mn/prepaidCard/index.php or call Customer service representative at 19001977, or simply visit any branch of our bank. Make sure to sign the back of the card before making your first purchase. Get 1% discount by purchasing oil from, M-oil stations. This card is your financial assistant when you travel, study or stay in overseas. 10% discount at Raffles hospital in Singapore. 1% discount at MT and M-Oil gas stations. 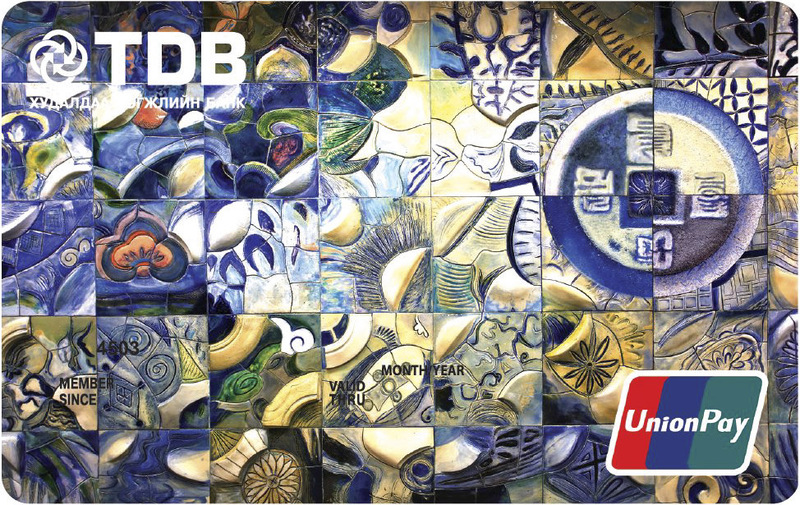 Please click HERE for UnionPay card Travel Destination offers. Please click HERE for UnionPay card merchant and offers. Can apply for a co-cardholder. Let’s save from each liter of fuel! For a mid-size car that crosses 30 kms (18.7 miles) per day, this payment card will save 81,800 tugriks on petrol per year. When purchasing the card, organization can decide on setting a limit according to the job specification of its workers. For 2 mid-size cars that cross 30 kms each (18.7 miles) per day, this payment card will save 163600 tugriks per one year. Today, women are making advances in every field; they are becoming highly educated and successfully working in every area. Regarding that, women are turning into the most rapidly evolving consumers with unlimited needs and desire. They want to get information about qualified products and services as quickly as possible. Thus, Trades and Development Bank of Mongolia is working in cooperation with over 100 organizations that provide high quality products and services across Mongolia to ensure that ladies access their needs. By obtaining Lady Card, customers can get discounts from certain organizations; the discount rates can vary for different organizations. Most of them include beauty salons, brand clothing, children’s stores and restaurants. Every month the number of organizations is increasing and our bank ensures that the field of service will also vary. In terms of organizations, merchants can promote their businesses successfully by cooperating with Lady Loyalty service. By doing this, they will win more consumers, increase their sales and, overall, make their businesses flourish. Bank welcomes businesses which have excellent business models that are genuinely consumer centered and merit. As for conclusion, by obtaining this card, women will open for themselves a great opportunity to buy qualified products and services with discount. Note: In order to receive the discount provided by Lady Merchants be sure that your Lady Card is swiped on TDB’s POS. Branch 1: THANN SACTUARY SPA-1, Genghis Avenue-29, Naran Plaza, level 3. Branch 2: THANN SACTUARY SPA-2, Seoul Street 42/1, Naran Mall, level 4. Branch 2: 4th micro region, Smart Centre. KHUD, south-west from “Bogd Khan” museum. This card is especially designed to facilitate financial operations of an Oriflame consultant. Card is specifically designed for Oriflame,including its logo, brand color and a company name; thus, it can be used as a business card for consultants. Regardless the bank’s working hours, order payments can be made from all over the world. Save from each liter of fuel! Can be used as a salary card. Plus, all other accounts can be connected to this card, so that there will be no need to place money separately for purchasing only oil. For 2 mid-size cars that cross 30 km a day each (18.7 miles) this payment card will save 163600 tugriks per one year. This card can only be used in Shunkhlai oil stations and for buying accumulators, antifreezes. TDB and Ulaanbaatar Department Store have issued payment debit card named “Burzai”. When you make purchase through this card, you will get discount from every workshop in UBDS. Coupon from UBDS which accepts to hold the card (when you make purchase above 57,000 tugrug once, UBDS will give it to you).